He is a sculptor, jewelry artist and designer. He received the Araw ng Maynila Centennial Award, the TOYM Award, and the Republic Cultural Heritage Award. He represented the Philippines at the Paris and the Venice Biennials. His sculptures dominate public places in Metro Manila, cebu, and various memorial parks all over the Philippines. 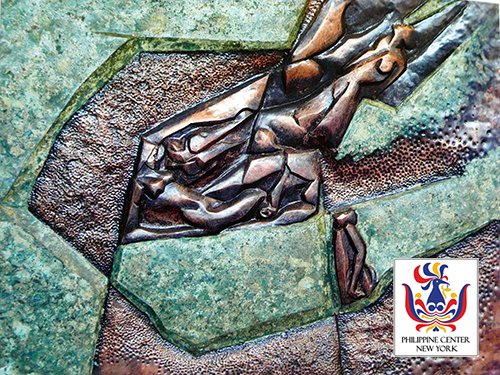 He creates figurative and abstract works in embossed copper and welded brass. He simplifies reality into planes, At other times he multiplies them into a mass of reverberating shapes. He explains that this is aesthetic, both a neo-realist and a cubist tendency, “is essentially the resolution of the conflict between representation and structure.” His work is a subject of several books, among which are Beyond Art by Dr. Rod Paras Perez (Loyola Group of Companies, 1970), and Breaking Out: An Eduardo Castrillo Sculptural Tour by Alfredo Roces, (inyan Publishers 1995).